Join us in Belize as we open our hearts and minds to new possibilities! Empowerment, heart connection and self-awareness are yours to have during this week-long retreat. Through self-inquiry, adventure, relaxation and lots of pampering, you will replenish, discover and ignite your wholehearted courageously beautiful self! Embrace your authentic wholeness - both tender and fierce. Ignite the joy that fuels your soul with renewed purpose! Why: When changes in life bring heartache and grief, it can leave us feeling lost, hopeless, exhausted and without purpose. There comes a time when we are ready to create new life. As we explore our old patterns rooted in fear, we can then begin to create a new purpose filled life, led by the wisdom of our heart. Think of this retreat as a soul tune up! Slow your mind, relax your body and expand your heart on this soul satisfying adventure. How: The adventure begins by webinar 3 weeks before our departure. During our time together we will explore and create our own unique wellness plan that honors and celebrates your wholehearted self! We continue the adventure in Belize with guided daily experiences, adventure, connection and relaxation. After we return home, we will continue the journey with two more meetings by webinar. Travel offers a unique experience and a chance to see life with new lenses. We will use many tools to engage our mind, heart and soul while exploring Belize. Who: Join Wellness Educator, Marni Henderson and our personal magical maker, tour and accommodations guide, Kelli Rae with Global Service Partnerships! Marni works with clients to begin the process of self-inquiry by exploring how our heart and mind communicate. We discover how grief, change and stress affect health according to your own unique coping skills and patterns. Your inner wisdom and awareness guides us to create action and engage life filled with hope, passion and joyful purpose. By the end of the retreat, we will weave all the pieces together with a personal vision plan that honors and celebrates you! Location: Caye Caulker, Belize! Twenty miles off the coast of Belize is Caye Caulker, a small, 5 mile long island with a population of about 1,300. With the motto being “Go Slow”, it is a natural place to replenish and relax. Transportation by bike or golf cart makes it a really fun adventure as full size vehicles are prohibited! Retreat: Spend the week together in Belize with guided daily experiences, adventure, connection and relaxation. Travel offers a unique experience and a chance to see life with new lenses. Post-retreat: After we return home, we will continue the journey with two more classes by webinar. This retreat is based on Marni Henderson’s expertise as a licensed Whole Health Educator and Coach™. We will explore our wellness through a wholehearted perspective while engaging our courageous self! This is not a counseling, support group or medical retreat. Numerous methodologies will be used to embrace our authenticity and discover the next step in living with hope while creating new life and joyful purpose. You can find out more on many of the topics covered in the retreat through her blog here! Coalesce Discoveries to provide this unique retreat. 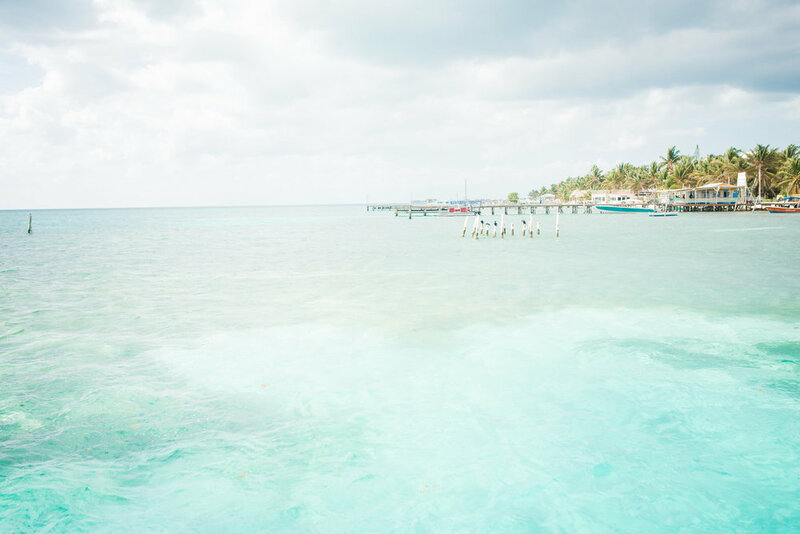 “After meeting Marni and Kelli months before our trip, I expected to have an amazing time in Belize, which in fact, surpassed my expectations. From the challenging ATM caves to snorkeling in Shark Ray Alley, it will go down as one of the best experiences of my life and one I will never forget. What I didn’t expect was to feel so comfortable around a group of women I hadn’t met before. With Marni’s comforting guidance I think we all learned that we aren’t alone in our feelings of loss and actually came away with the necessary tools to continue on our life journey to the fullest. I think Kelli said it best “sometimes circumstances bring special people into your life at just the right time, people you were meant to meet all along”. I will never forget my time in Belize or the amazing women I met there. I’m so happy to have met Marni and Kelli, two women who are truly striving to make a difference in this world and nailing it. I wasn’t interested in going to a grief group, I didn’t want to share my grief or experience other people’s despair. I went to Belize to enjoy a vacation. I understood I didn’t have to participate in any group sessions if I didn’t want to. My neice was worried about me going, she was concerned sharing grief with a group of widows would be too much for me.